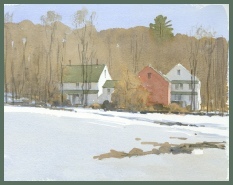 Barry W. Van Dusen is an internationally recognized wildlife artist living in central Massachusetts. His articles and paintings have been featured in Bird Watcher's Digest, Birding, and Yankee magazines and he has illustrated a variety of natural history books and pocket guides in association with the Massachusetts Audubon Society. In 1994 Barry was elected a full member of London's Society of Wildlife Artists. His work has been exhibited regularly in the prestigious Birds in Art Exhibition (Wausau, Wisconsin) as well as in many galleries in the United States and Europe. At the invitation of the Artists for Nature Foundation, Barry has travelled to Spain, Ireland, England, Israel , India and Peru, working alongside other wildlife artists to raise money for conservation of threatened habitats. 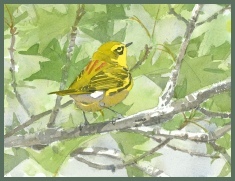 Mass Audubon BLOG features Barry Van Dusen’s travels and artwork! Barry Van Dusen is the Museum of American Bird Art’s latest Artist-in-Residence, and for the past three years, he has been travelling around the state visiting the Society’s sanctuaries (read more).